Filtration, and proven high performance. Countertop or Undersink with optional kit. DARC & cutting-edge Hydrogen Infusion Technology! 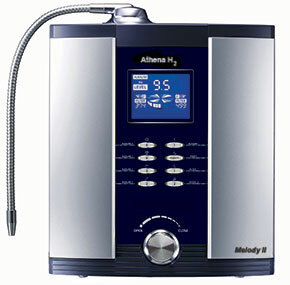 Ionized Alkaline Water is produced by a unique health appliance called a Water Ionizer. The Water Ionizer first passes the water from your kitchen faucet through an advanced filter to remove pesticides, chlorine, and contaminants. The water is then put through the ionization chamber which electrically splits the filtered water into alkaline water and acid water. This is done by running the pre-filtered water over positive and negative electrodes. A water ionizer will typically produce alkaline drinking water with a pH between 7 and 10. Alkaline water in the 8.5 to 9.5 range is sufficiently alkaline to produce the health benefits desired. Some of the characteristics of water produced by a Water Ionizer are: Healthy Alkalinity, Better Taste, Better Hydration, Antioxidant Activity, Increased Oxygen, and Ability to Detoxify.